Dr. Sung Ho Hyon talks about his work, how transplantation can save lives and what the future might bring for a cure for type 1 diabetes. Dr. Sung Ho Hyon (right) with Dr. Douglas Villarroel. Dr. 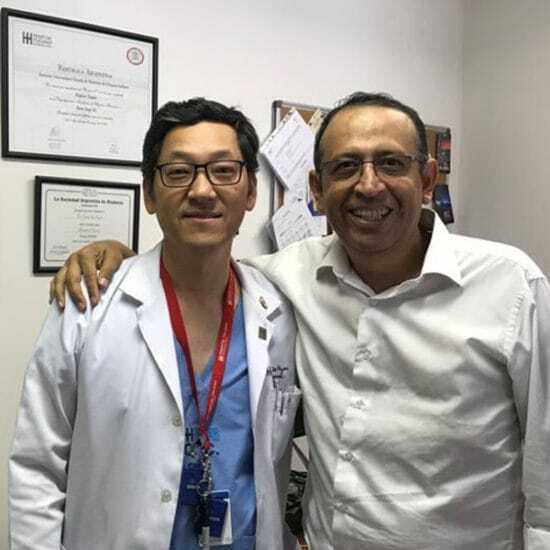 Sung Ho Hyon is Director of the Kidney and Pancreas Transplantation Program at Hospital Italiano de Buenos Aires, the largest multi-organ transplant center in Argentina and Professor of Surgery at Instituto Universitario Hospital Italiano Medical School. Dr Hyon talks to us about his work, how transplantations save lives and what the future might bring. What are the most common reasons why people need both a kidney and pancreas replacement? Simultaneous kidney and pancreas transplantation is the best currently available treatment for people with insulin-dependent diabetes and end-stage renal disease, also called end-stage kidney disease. It is well known that diabetes can affect the function of the kidney. When this condition turns severe, people may need dialysis and become candidates for kidney transplantation. Additionally, since insulin dependent diabetes is an autoimmune disease in which the cells in the pancreas that normally produce insulin are destroyed, a pancreas transplant can restore the function of these cells. How many people with type 1 diabetes have you helped with kidney-pancreas transplantations? What is the most difficult aspect of recovery for patients and what is a person’s long-term outcome? Our program has performed close to 160 kidney-pancreas transplants as of April 2018. In the early post-transplant period, i.e., the first three months after surgery, the most common complications are those related with the surgical procedure, such as thrombosis (formation of clots in the veins and arteries), bleeding, and leaks. However, these complications are not frequent and patients usually recover very well from surgery. Other important issues to consider are close monitoring of infections and the rejection of the transplanted organs. To prevent these two complications, patients are given antimicrobial and immunosuppressive drugs, respectively. The measure that is used by doctors to describe outcome is the survival rate. The survival rate for patients with a simultaneous kidney-pancreas transplant is around 95% at 1 year (short-term), and close to 87% and 80%, at 5 and 10 years, respectively. When you were in medical school, what factors gave you the idea to become a surgeon and why kidney and pancreatic transplantation in particular? I was attracted to surgery since the very beginning of medical school. One of the subjects in my freshman year was human anatomy. As soon as I completed the final exam, I walked up to the department head´s office to offer myself as an assistant for the preparation of anatomical specimens like the ones used during the anatomy classes. This provided great training. During my clinical clerkships, I learned that surgery comprised a close and direct relationship with patients in a continuity of care, in the hospital rooms, the operating theater and also the outpatient office. This was the kind of practice I wanted for the future. Ever since medical school I was impressed by the life-long struggle of people with diabetes. Especially those whose onset was early, during childhood. It depends on the entire family’s commitment. During my residency in surgery, I learned that a surgical procedure could “cure” diabetes and free patients from chronic dialysis and the dependence of exogenous insulin. At the time, I was finishing my medical residency, the Kidney and Pancreas Transplantation program at my hospital had just performed one combined kidney-pancreas transplant procedure. I joined the program as the first Fellow, and that was more than twenty years ago! Ever since medical school I was impressed by the life-long struggle of people with diabetes. Especially those whose onset was early, during childhood. It depends on the entire family’s commitment. Why is it rare that people with type 2 diabetes have both kidney and pancreas transplants? Can you explain why a person with type 2 diabetes will need a kidney transplant? How common is this occurrence? It is more frequent for people with type 2 diabetes to undergo kidney transplantation only. This is because in type 2 diabetes, the problem is not in the production of insulin, but in the ability of cells to utilize this hormone. Moreover, people with type 2 diabetes may have an exceeding production of insulin. However, there are a number of people with type 2 diabetes that may require injections of exogenous insulin, just like people with type 1 diabetes do. These patients, who have end-stage renal disease and need insulin, may benefit from a kidney and pancreas transplant. About 8% of all kidney and pancreas transplants in the world have been done on people with type 2 diabetes. Can you explain the difference between pancreatic islet transplantation and pancreatic islet encapsulation? The pancreas has two main functions: production of enzymes (for digestion of food), and production of hormones. Insulin is one of these hormones, and is synthetized by the beta cells within the islets of Langerhans. Thus, pancreatic islet transplantation is an alternative form of pancreas transplantation in which only the hormone producing cells are transplanted. Islet encapsulation is a laboratory process in which islets are inserted into capsules of alginate (a substance obtained from algae) with the intention to protect the cells from the recipient’s immune system. Still an investigational practice, it is used to encapsulate pig islets before transplantation into other species, including humans. What do you believe the future holds for a type 1 diabetes cure? Do you believe islet encapsulation is one approach to curing type 1 diabetes? We agree that a “curative” therapy of diabetes, must necessarily meet a fundamental condition: to achieve a perfect metabolic control of blood glucose. The best way to do this will be by restoring the person with insulin-dependent diabetes’s insulin-producing cells. These cells should be capable of producing insulin, but also to respond correctly to the ever-changing blood glucose levels. Likewise, they should be infectiously safe, immunologically adaptable and ethically acceptable. It is obvious that the first option is pancreatic islets. However, there are several lines of research that could result in a definitive treatment of diabetes: gene therapy, tissue engineering, expansion from beta cell precursor ductal cells, xenotransplantation, differentiation from stem cells, cell immunomodulation, or the most recent proposals for transdifferentiation and cell interdifferentiation. Islet encapsulation is just one of the current lines of investigation. Perhaps, the answer will come thanks to the combination of more than one of these strategies. Thank you to Dr. Sung Ho Hyon for giving us a greater understanding of Kidney and Pancreas Transplantation.